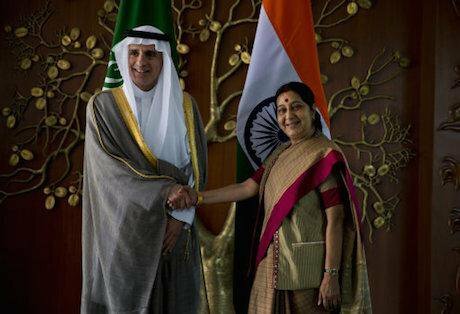 The Saudi and Indian foreign ministers, March 2016. Saurabh Das/AP/Press Association. All rights reserved.Saudi Arabia has been unfurling its geopolitical desires across the Middle East for quite some time. However, courtesy of an oil-revenue boom in recent years, Saudi is shifting its interventionist tactics from proxy to direct military intervention. From crushing legitimate protest in Bahrain to bombing Yemen and hounding Lebanon, first Abdullah and now Salman have left no stone unturned to assert their position as a shot caller in the Middle East. They have sent armies across King Fahad causeway to the tiny nation of Bahrain and besieged Yemen to starvation. Had it not been for Putin’s murderous incursion into Syria, Salman, in concert with Turkey’s dictator Erdogan, was ready to deploy his airforce independant of the US-led anti-ISIS coalition. Fighting a sectarian air-war in Yemen, Saudis have made a mockery of humanitarian and human rights laws; from using indiscriminate cluster bombs to decimating hospitals and marketplaces. But the absence of formidable ground force means that they have not been able to achieve any of the set military objectives. Houthis still control much of the country, including the capital Sana’a. The Saudi-backed ousted government of Mansour Hadi faces opposition even in its stronghold of Aden. Al-Qaeda virtually rules over a state in the south-eastern port of Mukalla with a constant revenue stream and looted reserves worth $100 million. ISIS is also on the rise. Ground force has never been a forte of the Kingdom. Throughout history, the super rich, laid-back Saudis have sought foot soldiers from Pakistan and the US. However, when Salman and his over ambitious son/defense minister Mohammad requested military power from Pakistan last year for their turf war in Yemen, their traditional ally defied the diktat. Pakistan’s parliament overwhelmingly voted against any military intervention and a flurry of newspaper editorials and public opinion hailed the decision. Nawaz Sharif had failed to reciprocate the assistance he received from Saudi when Parvez Musharraf ousted him from power. Pakistani defiance might have also been reinforced by their recent pivot towards Russia and China. In late 2014, they signed a military cooperation agreement with Russia containing a covert clause for arms purchases. China has also pledged to invest around $46 billion in Pakistan, a substantial part of which will surely go into military coffers. The controversial project that includes expansion of Gwadar port in Baluchistan is set to link western China to the Persian Gulf, competing with Dubai and Doha as economic hubs in the region. Although there is strong indigenous opposition to the project, Indians along with Emiratis and Qataris might also find common cause in derailing it. The Pakistani military is also creating a new special division to protect Chinese interests inside the country. This must have left Saudi fuming. If Sharif can expend 10,000 troops and a two-star general for Beijing, why is Riyadh’s destructive war in Yemen a no-go? Despite the fact that Sharif and his army chief, Raheel Sharif (no relation) flew to the Kingdom not long after the Yemen fiasco and reassured the monarchy of Pakistani allegiance with a joint military exercise, Saudis seem not to have forgotten the betrayal. Saudi bitterness has been made more than evident by the Kingdom’s overtures towards Pakistan’s archrival India. During Narendra Modi’s recent visit to Riyadh, Salman personally conferred Saudi Arabia’s highest civilian award, the King Abdulaziz Sash, upon India’s prime minister. The two countries also signed agreements for intelligence sharing, trade and defense cooperation that includes holding joint military exercises; Saudi shamelessly dodging the fact that Indian forces have been engaged in illegal occupation and massive human rights abuses in Kashmir, northeast and central India. The act also created a lot of justified resentment in Muslim communities across online spaces, considering the fact that Modi has been accused of leading a pogrom against Muslims during the 2002 communal riots in the Indian state of Gujarat, when he was chief minister. As many as 2500 Muslims were killed, and a 2012 report by Human Rights Watch accused officials of the Gujarat state government, led by Modi, of failing to “conduct serious investigations and obstructing justice” for the victims. For this reason, Modi remained on the US State Department’s visa blacklist from 2005 until the Obama administration lifted the ban in 2014. In a 2013 interview with Reuters, Modi infamously likened the wholesale killing of Muslims in Gujarat to a “puppy coming under a car”. India has also seen a spiraling rise in communal and caste-based violence since Modi’s far-right BJP took the reins of power. Muslims have been lynched for suspected consumption of beef and trading cattle; everything from academic autonomy to welfare schemes have been encroached upon. Although Modi cannot even come close to the scale of mass-murder that successive Saudi regimes have overseen in their country and neighborhood, Salman adorning an Indian Hindu nationalist with its highest civilian award is surely going to raise eyebrows in Islamabad – thus fulfilling the primary purpose of this gesture. Saudi Arabia’s dwindling market share in oil may be another crucial factor forcing the pivot towards India. During the past three years, Saudis lost ground in 9 of the 15 most important oil markets across the world including the US. Losing ground to US fracking, Russia, and Iraq, and with post-sanctions Iran set to unleash massive oil reserves across global markets, Saudi Arabia might also be trying to appease Indian oil-hunger early with these sweet gestures. Currently, India imports 18% of its oil from Saudis. There is surely room for more. Saudi Arabia’s ambition to diversify its economy requires the massive Indian market. Modi’s excessively capital-friendly regime should come in handy for that purpose. This also comes at a time when Iran's president Hassan Rouhani made a high-profile visit to neighboring Pakistan in March, the first Iranian president to do so in fourteen long years. The purpose of the visit was to shore up annual trade to the tune of $5 billion, along with reinforcing security cooperation between the two countries. Whether Islamabad substantially responds to Rouhani's approach, threatening traditional power equations across Asia, remains to be seen. However, the hypocrisy of Saudi’s self imposed position as a “leader of Muslims” should be crystal clear by now, especially after the Kingdom’s latest adventures vis-à-vis Modi’s India and Sisi’s Egypt.